Cheng Yu is an internationally renowned pipa and guqin virtuoso, scholar and specialist in Chinese music. She holds degrees in Chinese music from Xi’an Conservatory of Music, China (BMus.) and the School of Oriental and African Studies (SOAS), University of London (MMus, PhD). She performs, records and researches both traditional and contemporary Chinese music as well as cross-cultural music collaborations. She is the founder of the UK Chinese Ensemble and London Youlan Qin Society and currently teaches the pipa, guqin and Chinese ensemble classes at the School of African and Oriental Studies (SOAS). Born into an artistic family in Beijing, she grew up in the Gobi desert in Gansu, Northwest China where her family had been exiled. 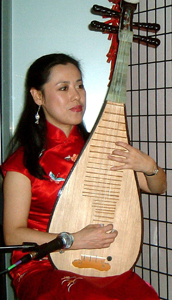 Cheng Yu studied the Pudong style of pipa with her father from the age of 7 and was later trained by experts in the Pinghu style of pipa. She held her first concerts at the age of ten. At the age of 13 she won first prize in the National Youth Competition for the Performance of Traditional Instruments. She studied the guqin with Prof. Li Xiangting and at the Xi’an Conservatory where she graduated with distinction in pipa and quqin performance in 1987. After winning the outstanding pipa player award in China in the same year she was selected as a pipa soloist in the prestigious China Central Orchestra of Chinese Music in Beijing. Since the 1990s she has been based in London and has performed over 600 concerts including venues such as the Purcell Room, Queen Elizabeth Hall and Duke’s Hall in London. She has toured in Europe, Asia, Canada and the USA, has worked on various musical creations with organisations such as WOMAD, Grand Union, the London Sinfonietta, the Lyon Ensemble Orchestra Contemporain, the Avignon Orchestra, the Edinburgh String Quartet and World of Strings. Her published CDs include 3 solo albums, and many ensemble and cross-cultural music recordings under such labels as Realworld, ARC, China Arts, BMG and EMI. In 1995 she completed her Masters degree in Ethnomusicology; in 2004 she completed her PhD on the ancient music of Xi’an, both at the School of African and Oriental Studies (SOAS), University of London. She is currently teaching pipa, guqin and Chinese ensemble classes there. Her recent research projects include the recreation of the 5 stringed pipa (lost since the 8th century Tang Dynasty) which won her major awards from Women in Music, the Arts Council of England and the Arts and Humanities Research Council. The world premiere of the 5-stringed pipa in spring 2005 was highly acclaimed and a CD recording was published in spring 2006. In 1994 she co-founded the UK Chinese Ensemble. Cheng Yu’s many published recordings include her pipa and guqin solo albums and a number of CDs with the UK Chinese Ensemble and in collaboration with musicians from other parts of the world.